Toilet flapper repair, what could go wrong with such a simple device. A toilet that runs intermittently without being flushed will usually have a malfunctioning flapper. Not sure what your problem is? See the article on 'How To Fix a Toilet' to narrow down your problem. At times the chain may hang up and cause the flapper not to close correctly. The rubber can age and it may not seat correctly. 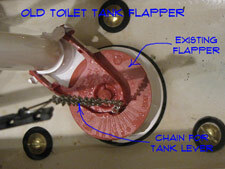 Adjusting or replacing the toilet tank flapper is a quick easy job. The toilet flapper is not the only thing that can cause a toilet to run. A bad toilet flapper will cause the toilet to leak water into the tank and then run intermittently. A toilet that runs constantly is usually caused by a bad fill valve or a float that is need of adjustment. Does it sound like the toilet fill valve? Check out this article on replacing the 'Toilet Fill Valve' and adjusting the float. You can save a service call, $50 to $100 plus the mark up for the parts. A new flapper is around five dollars. A toilet flapper repair is one of the easiest home repairs you will find. This is a simple thing, nothing else to check. OK, there is one thing, check the chain and make sure it is not tangled. Worried about losing water. Shut the water supply off while you work on the flapper. I usually don't bother. Adjusting or replacing takes about five minutes. The water is cold, not a good idea for someone with arthritis. Most of the time, replacing the toilet flapper will solve the problem. It is worth the risk to try and replace the flapper first. Sometimes the rim of the flush valve corrupts and even a new flapper will not seal as it should. Replacing the toilet flush valve is a fairly big project. It does involve removing the toilet tank. The toilet tank is held in place by bolts and there is a seal between the tank and the bowl. Unhooking the supply line, draining the tank, removing the flush valve, installing the new flush valve, setting the tank and getting it working again could easily take two to four hours. 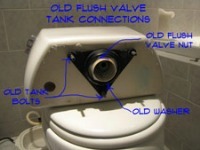 Need to replace your 'Toilet Flush Valve'? Make sure you have tried fixing the flapper chain and replaced the toilet flapper before you decide to do this. See the article 'Replacing a Toilet Flapper' for more information. In Step One the article 'Checking the Flapper Pull Chain', helped you to make sure that the pull chain is free and working properly. This is the simplest fix of all. 'Replacing a Toilet Flapper', covered what to do when the flapper is old and worn. It may have not been seating properly, causing the water in the tank to drain down. Replacing the toilet flapper may not have solved your problem. The article, 'Toilet Flush Valve Problems', discussed what to do if the flapper will still not seat properly. You can't get much simpler when it comes to a repair project. A few dollars and a few minutes should be about it. I love jobs like this, when you can be a hero and not have to put out much effort. I hope that your toilet flapper repair was not a problem. In addition, I hope that it was successful. A toilet the runs off and on and leaks constantly can be very irritating. Having solved this problem you can move onto other home repairs that you may have.